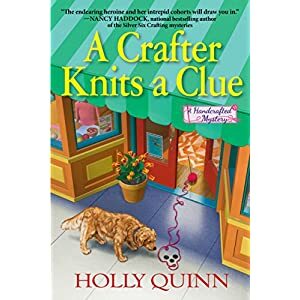 A Crafter Knits a Clue by Holly Quinn is set in a small town full of caring folks. Sammy's craft store seems like the center of town with crafters selling their wares and clubs meeting to work on special projects. When a murder occurs in the local yarn shop it seems like so many clues are placed in front of Sammy she can't help but get involved. The cast of characters in this cozy mystery is about as long as there are residents of little Heartsford WI. The author weaves a lot of clues within this story and just when one suspect appears another one seems more likely to have committed the crime. I recommend this book to anyone who enjoys a bit of mystery mixed with crafting and a touch of romance. Sammy just can't let a clue get by her and when she has a brush of danger there is a certain Lieutenant Liam Nash who is close on her heels. This book is the first in a new series by Holly Quinn and likely to develop a following.